Offering you a complete choice of products which include usb serial converters, rs232c to rs485/rs422 converters, rs232 to rs485 splitter, ethernet to rs232/rs422/rs485 converter, rs485 repeater and rs232 isolators. 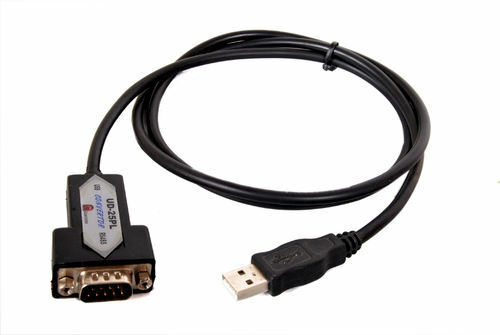 Recognized in the industry as one a prominent firm, we are involved in providing a quality assured range of USB to Serial (RS232C) Converter. Widely known for their uses in different industrial applications, our offered collection of convertor is well built and designed by our professionals using advanced tools and machinery. Moreover, these are dispatched by us at the door of our clients within the promised time. 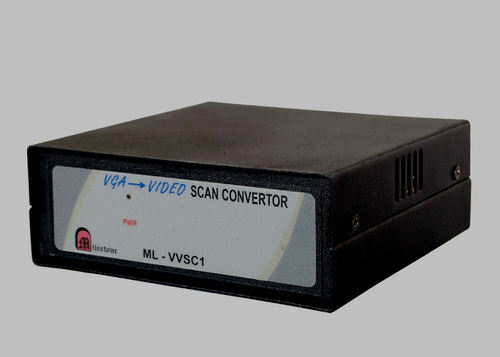 Banking on our huge knowledge and expertise in this area, we are readily instrumental in providing a quality advanced collection of RS232C to RS485/RS422 Converters. Our offered range of products are hugely accredited for exhibiting international quality norms and guidelines are thus are highly favored by our customer. Together with this, these are quality guaranteed by our quality inspectors who assure their supreme quality before final shipment of the order. 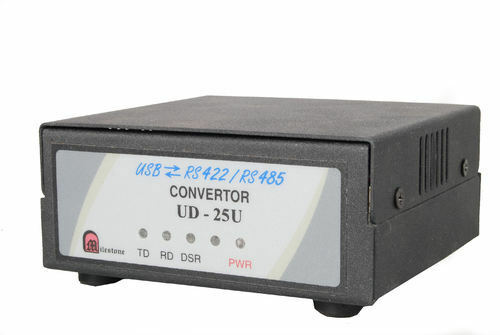 This is a converter, which supports only RS422 interface (full duplex) 4 wire on RS422 side and is with opto isolation, surge protection for individual signals. This is a plug in RS232 to RS485 converter, very small, compact without opto isolation but with surge protection. This unit is self powered using DSR or CTS signals. External 5V required if DSR or CTS not provided. 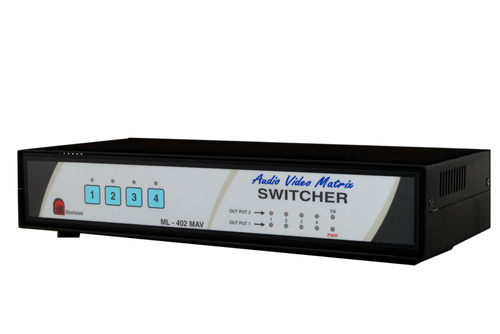 For selecting 2 wire or 4 wire on RS485 side 2 way selector switch is provided on the unit. This is an industry standard Din rail panel mounted RS232 to RS485 / RS422 converter. Provision for 2 wire / 4 wire selection. The standard unit works on 230V AC (option 1OV DC- 40V DC). 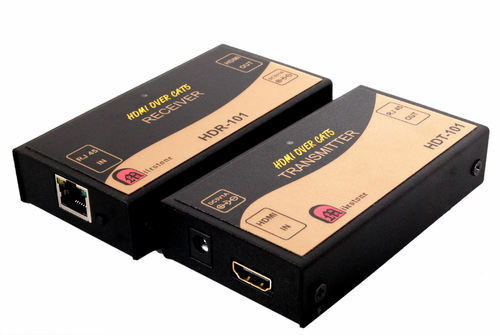 So as to cater the variegated and ever rising needs of our customers in the most effective manner, we have been offering a broad and unbeatable collection of RS232 to RS485 Splitter to our customers. Designed at par with the globally accepted norms, we guarantee that only top grade inputs are being used in the fabrication of these splitters. Moreover, their reasonable rates and low maintenance makes these highly demanded. 1 RS232 input to 4 RS485 Outputs. 1 RS232 input to 8 RS485 Outputs. 1 RS232 input to 16 RS485 Outputs. Milestone Model IP-2535U is a ETHERNET to RS232/RS422/RS482 Convertor and is designed for high speed isolated data transmission between computer system through its ETHERNET port and peripherals or other devices having RS232/RS422/RS485. Output supports 2 wire - (+ & -). 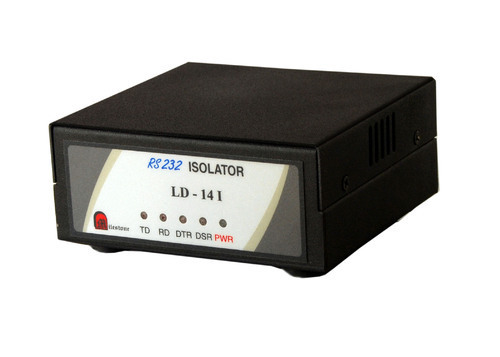 Milestone's RS485 Repeater/Isolator is designed for driving RS422/RS485 ( 4/2 wire signal) to a long distance. Additionally, input and output signals are isolated and outputs are surge protected. Rare panel as a switch for selecting 2 wire or 4 wire. 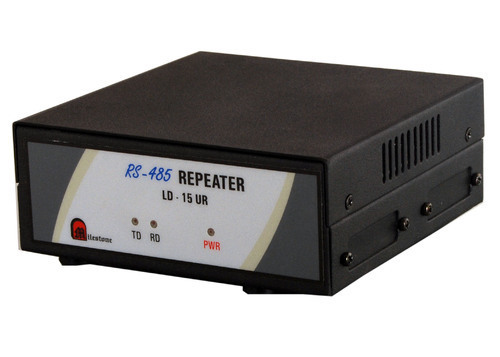 Milestone Model LD15UCR is “RS485 (2 wired) to RS422/RS485 (4 wired) Convertor Repeaters” which is designed for Converting RS422/RS485 from 2-wire to 4-wire and vice versa & driving signals to a longer distance. Additionally, input and output signals are isolated. RS485 (2 Wire) to RS485 (4 Wire) Convertors. 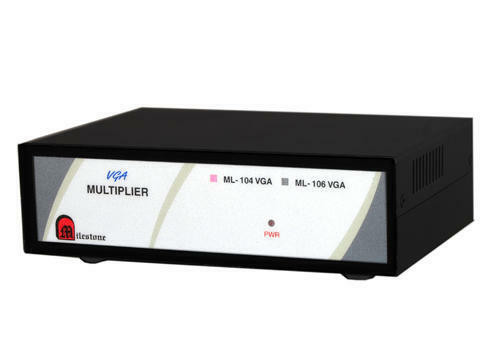 Milestone model ML-104SD/ML-108SD/ML-112SD/ML-116SD is a “RS232 Distributor” is designed for high-speed data transmission between computer system and or peripherals. 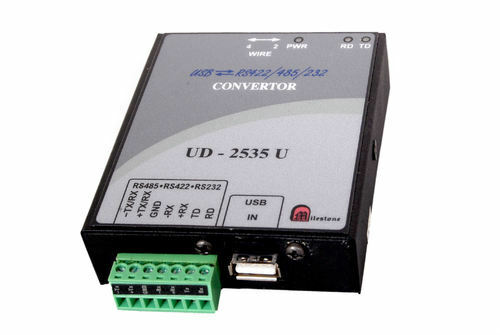 Application for these converters can be for factory automation, programmable logic controllers, attendance recording systems, Barcode Readers, remote data transmission, remote terminals, EPABX. 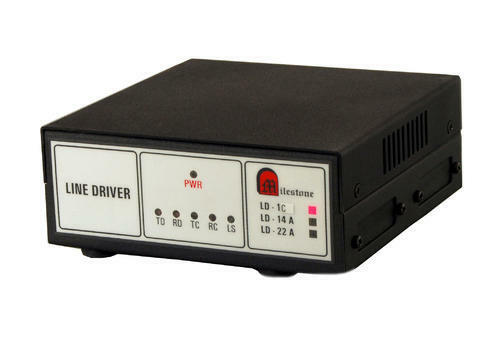 “Milestone's “UD-25U” is a USB/RS232 to RS485 Convertor and designed for high-speed data transmission between computer system through its USB Port or RS232C Port and peripherals or the other devices having RS485 interface over long distance under high noise conditions. LED indication for TX, RX and POWER. USB drivers provided with the unit. 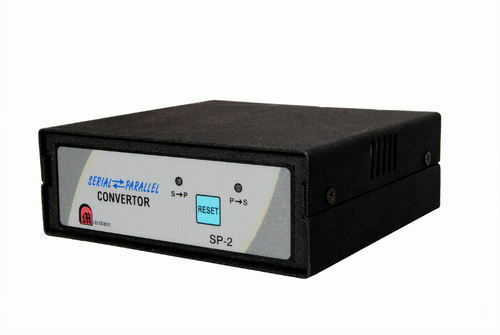 It is a bi-directional converter useful to convert RS232 to 0-20 mA current loop and vice versa. Uses Tx and Rx only (DTR, DSR optional). Supports all combination of current loop i.e. Looking for “RS485 Industrial Products”?